Renee Y. Chow offers an alternate vision to the conventional suburban housing that characterizes much of our domestic landscape. Her integrated, original approach to design sees the residential setting as a fabric of interrelated spaces that supports cultural diversity and change, promotes sharing in a setting, and sustains a more intense use of land. 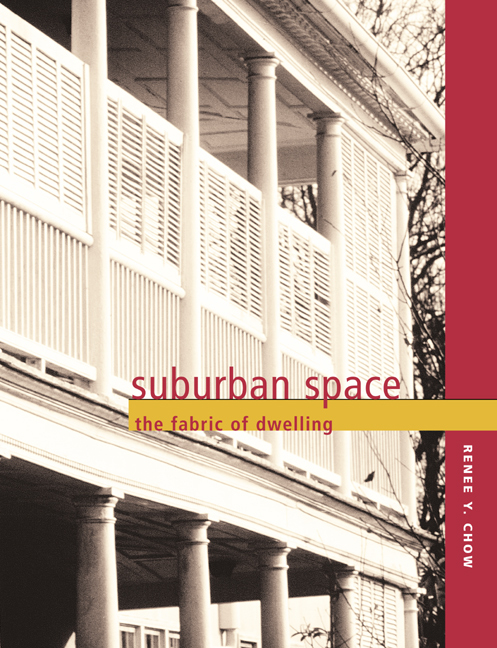 With its concise, informative text and abundant illustrations—including photographs and Chow's superbly executed drawings—Suburban Space challenges architects, landscape architects, developers, and planners to reconceptualize suburban housing. Chow has made comparative studies of neighborhoods in Boston, Charleston, San Francisco, Levittown, Radburn, and housing by Rudolf Schindler and Irving Gill, as well as other residential settings. Her argument for a fabric of dwelling is founded not on generalizations about how people live but on documented observations of the particular ways in which people organize their daily lives. This groundbreaking book demonstrates how one of the most disparaged yet common types of housing in the United States can become more environmentally and culturally viable. Renee Y. Chow is Associate Professor of Architecture at the University of California, Berkeley, and a principal of Studio URBIS.